Music sounds free in nature! We are glad to invite you to the 4th edition of Waha Festival during 23-26 July 2015! It will be, as you are already used by now: in nature, under the moonlight, in the fresh summer air, the perfect moment of the year to gather-up, make friends and enjoy music and nature. Together. We will have four stages under the clear sky, where you will feel the music fully from morning till morning. On the Deep Stage we bring together the best DJs and producers from the underground scene in Romania but also from important cities like Berlin, Moscow, Gent and Lisbon. The Psy stage offers a lineup that goes through progressive, forest, psychedelic and also a bit more intense styles for the special hours before sunrise. Both will be equipped with Funktion One System so you can dance endlessly on the warm and powerful sound. We created also the Live Stage that will host performances and spectacles with live bands and special DJs, and the Chill Stage, waiting for you in the central zone, Luminish, with Romanian artists and traveling artists that will help round up the atmosphere with their musical trips. You are free to enjoy nature, dance, express yourself and participate as you feel if you want to co-create the experience you desire: costumes, body painting, performances, workshops, you can do anything you feel to contribute to a more colorful festival for all of us. Because we understand how important it is to gather up with open hearts, we created Luminish, as the gathering place for exchanging ideas and practices including artistic workshops and craftsmanship, barter market, cinema, Visionary Art Gallery, a space dedicated to kids and the Healing Zone. For the 4th year we are gathering the most open minded Community in Romania of healing, meditation and alternative therapies. We invite you to feel the nature, discover and strengthen your connection to the Earth and yourself. For a few days we will create together an alternative society, built on sharing, trust and exploring intelligent ways of using the resources in total respect to nature. Search for a special place to install your tent, maybe under a tree or near running water, personalize it and make it enjoyable for yourself and whoever wishes to join. Bring all that is needed to live comfortable in nature and create your own space for an amazing experience. 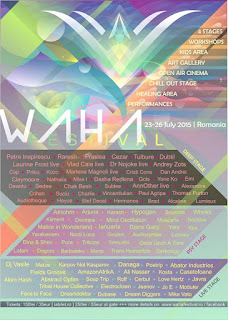 Up until now, more than 40 artists decided to join us on the 4 stages. Stay tuned as the list is still open to the audience and the stage. This summer already sounds better!